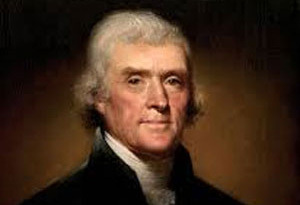 The next upcoming Thomas Jefferson Birthday is on Saturday April 13th, 2019. Thomas Jefferson's birthday is held on April 13 each year. He was the third president of the United States and one of the principle authors of the Declaration of Independence. Thomas Jefferson served as President of the United States from 1801 though 1809. His political leanings were republicanism (individualism vs large central government or federalism). He served as United States Minister to France in 1785 and later as Secretary of State 1790 to 1793 under President George Washington who is honored with the national holiday Presidents Day. He was born April 13, 1743 in Shadwell, Virginia and represented Virginia in the Continental Congress. He served in many capacities throughout his years including a leading role in the purchase of the Louisiana Territory from France in 1803. He died on July 4, 1826 in Monticello, Virginia.